The foreign exchange market has continued to thrive throughout the global financial crisis, providing some welcome profits for beleaguered financial institutions. Average daily turnover has surpassed $3 trillion in the world’s biggest financial market, with online trading systems in particular experiencing a dramatic rise in volume. Increased volatility in the market and big shifts in cross-border portfolio flows have spurred the growth in trading. The best foreign exchange banks are those institutions that provide fast, reliable and cost-effective services to global businesses and investors, as well as advice and innovative products to meet the specific needs of their increasingly diverse range of customers. 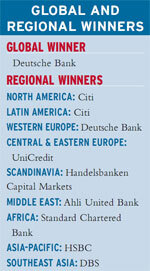 Global Finance selected Deutsche Bank as the global winner. We also chose the leading foreign exchange banks in 82 countries and regions, as well as the best online trading systems, including bank-owned, independent and retail trading systems. In addition, we selected the best bank for foreign exchange research, as well as separate award winners for fundamental research, technical research, currency forecasts, and strategy and hedging. Foreign exchange is likely to remain an important profit center for banks and a closely watched market in the months ahead, as the spreading global economic slowdown heightens fears of competitive devaluations, especially in Asia, where China has recently slowed the rise of the yuan to ease the pain being felt by its exporters. Market participants also are anxious to see the unfolding dollar policy of the incoming US administration. 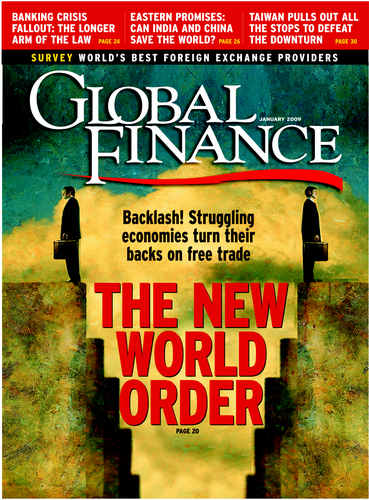 It seems certain that the foreign exchange market is due for some interesting times.